So, as I started to get to get bigger in my pregnancy, my sister’s boyfriend would jokingly say ” it would be soon time for cow tippin’ ” and would sometimes “moo” at me LOL. 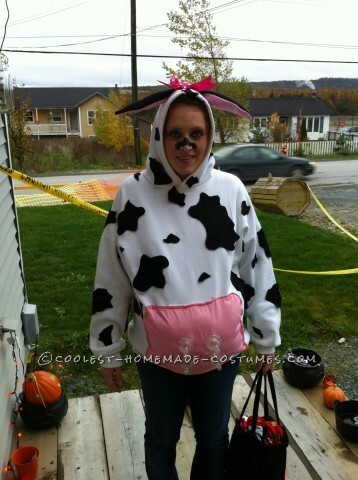 As Halloween approached I knew I would have to something, as I always dress up to take my eldest son trick or treating, I thought it would be funny to make a cow costume. I got my creative juices flowing when I found an over sized white hoodie with a pocket in front, that was ready to be donated. OK, so now I was ready for the ears, so I traced the shape of a stuffed bunny that I had lying around and cut 4 pieces, 2 pink and two black, with wrong sides together I pinned and stitched along the long edges leaving the bottom open for turning and stuffing,. Once stuffed I sewed the last edge closed and hand stitched my ears in place on the top of the hood. Next I made a girly bow to hide my raw ear edge and hot glued it into place. Almost done!! I had one of those snuggly’s lying around that was NEVER used around my house, ( you could also use black felt), so I started cutting cow spots, nothing fancy just random spots, and started hot gluing them on my sweater!! Slapped a bit of makeup on for my nose and that’s it, easy-peezee, it took maybe 3 hrs start to finish, about 5 dollars ( since I had most of the materials on hand) and a few minor burns from my hot glue gun, but all my neighbors got a kick of me trotting around the neighborhood all day and a few even said I looked moo-voulous! Hope you all enjoy.